Obama has displayed good judgment. insight, intelligence and even portions of an economic plan to restore America. His relative 'lack of experience' (as Republicans like to coin the phrase), is countered by Biden's experience and his foreign policy credentials..
McCain's ignorance of current events, his absent mindedness, along with his overall lack of intelligence is countered by Palin's ..... hmm, uhhh.. INEXPERIENCE!!! If any of you think Karl Rove is somehow being genuine, you're wrong. While we sit and comment on internet news stories, he and his staff are scarmbling to find an "October Surprise" to spring on the American people about Obama and/or Biden, if they haven't found something they think can stick. Mark my words. The solution: do MORE than just vote. Talk to those people who are still (unbelievably) on the fence. Volunteer to drive people to the polls on Election Day. Do NOT be shy about why you're voting for Obama/Biden. NO ONE can afford another four years of what we've ALL endured the past EIGHT – republicans and democrats alike and everything in between. It's a trick. People are asking for less "drawn-out" and more precise answers from Obama. Rove wants America to think that Obama is all words and little substance. Let's let Obama know to give them the substance and keep it simple!!! Of course Palin was a political pick, McCain needed it to boost his ratings. And maybe that will help him temporarily, but frankly it scares me when a man who wants to run our country makes an ignorant decision like picking Palin (when he could have picked someone with much more experience). Do we want someone leading our country who is just looking out for himself? At least Obama is looking out for our country and picking someone who is qualified to be Vice President, and is not just a show boat pick. Hey Michelle in Philly, you're an idiot just like your stooge presidential candidate. How is it that I've been agreeing with Karl Rove all of a sudden? He's actually been telling the truth, some..
Karl Rove telling the truth.. GOP steered the country in a bad direction yet still has a fighting chance to win, is this election getting wierd or what? Rove realizes he will need work after next year. I smell a book deal. Why is Karl Rove an ANALYST instead of an INMATE? I still blame him for helping the worst president in our nation's history get elected. He is right on one thing. Sarah Palin will come down off of her pedestal as soon as she starts answering the questions voters want asked. Karl Rove is really working to defeat McCain. His recent actions and statements certainly don't support him at all. The question becomes: Why is Karl Rove working to defeat McCain? I REALLY wish CNN would stop paying attention to the stupid things that come out of Karl Rove's mouth. He is completely irrelevant to anything. McCain will be the only maverick running with the experience to change DC. Where was he for the last 26 years? If he REALLY wanted to shake Washington up GOP was in charge of the WH, the congress and the senate for 6 years. The results: economic collapse, foreclosure,2 wars and 911. It won't die down if the Obamatards think they'll win the election by smearing ANOTHER woman. God, I can't wait for the debates. I only hope they're moderated better than the primaries. I once stood 3 feet from Rove. He looked at me and initiated movements that could possibly have lead to....SHUDDER... a handshake! He saw the look of horror on my face and turned away. 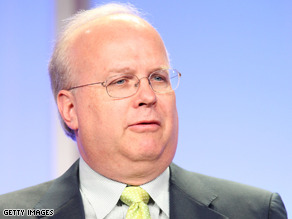 Who cares what Karl Rove is lying about these days? He needs to be in jail. Obama has never attacked Mrs Palin. Who is arrogant, Mr Rove, or Turd Blossom, as the few who love you call you? This time we want an intelligent president. If he uses a few big words that you don't understand, then so be it. Sorry! Has Rove become a born again or wants to make it right for his wrong doings in the past two elections? Or is it another ploy of the republicans to throw Obama campaign off guard. They need to be careful and watch closely. It is hard to trust person who has such bad reputaion even if he is saying something that is true and sincere. We all know that, but good spin. keep telling us what we all already know, to keep yourself relevant. It looks like Mr. Rove is fishing for a job as a political pundit. Why doesn't John McCain get the economy? "Sound fundementals" = out of touch. why are these CNN articles all biased towards Obama. They are taking words out of Rove's mouth. It is plain common sense that someone like Palin will not enjoy the same media coverage for another seven weeks. Rove is just stating the obvious that every Republican will admit. I don't know....either McCain did something to turn Rove off or Rove turned into a new leaf? I am betting on that Rove is bitter. I just can't trust Rove. Why do we even pay attention to Rove? He's entirely a nonfactor in this election. Why is this at the top of the political ticker. Gives a platform to someone whose voice has dominated our political consciousness for far too long already. Could we just pay attention the candidates? Kthnxbye.